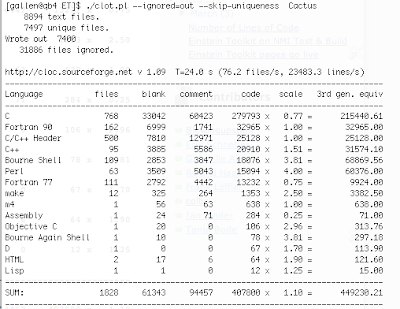 I ran Cloc on the Einstein Toolkit to count how many code lines there were. This ignores CCL, par, tex, data and other files it doesn't know about. It comes up with just over 400,000. The Objective-C in this list is probably Mathematica source, as both share the file extension ".m".